Last month, for my mom's birthday I attempted a new project. 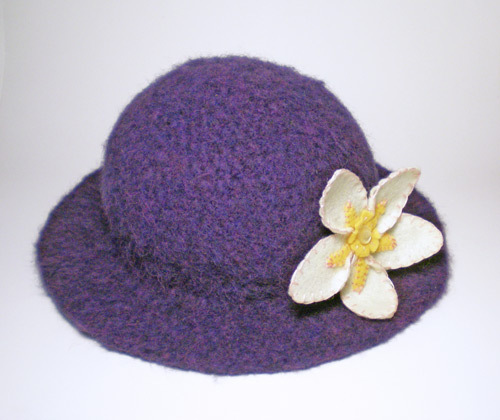 In one of my knitting books there are instructions on how to make a crocheted and felted hat. I had in my yarn stash a nice dark purple wool yarn, purple being my mom's favorite color. Sadly the instructions were for a child-sized hat and a yarn that I didn't have, so I used those instructions for inspiration and made up the actual pattern. Since I knit all the time, my first instinct was to knit the hat, but even with my limited skill I knew crocheting would be faster. 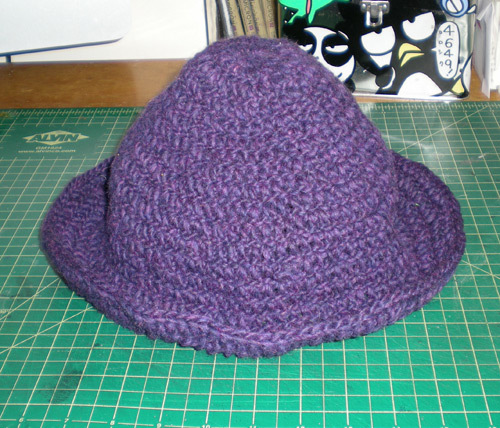 With a size 9 (5.5mm) crochet hook I double crocheted the hat, trying to make the stitches as loose a possible. If I was to leave it as is, it would make a very misshapen hat. I don't have much felting experience but I knew that I could manipulate the shape of the finished hat. 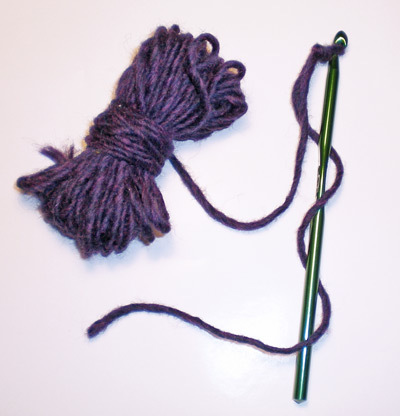 I did a test swatch of the yarn to see how it would felt and how much it would shrink. I did this by hand in the sink. The swatch didn't shrink too much but it didn't felt much either, which I attributed to not agitating it long enough. I took my chances and once the crocheted hat was done I stuck it in a bag and attempted felting it in the washing machine. This didn't turn out well, it really didn't felt much at all. I didn't try the machine technique again, instead I attacked the hat by hand in the sink. I used to dish scrubber brush to rough up the fibers to get them to grab each other. It took awhile, but the fibers eventually felt together. With the hat still wet but felted to my satisfaction, I created a makeshift hat mold out of Alec's Darth Vader cookie jar and some cardboard. It took about 48 hours to completely dry, but once it did the wonky crochet shape was gone and it was a nice round shaped hat with a flat brim. On the inside I added a ribbon band to give some stability to the size. The finished hat is not felted to the extent that you can no longer see any of the stitches but it does have a nice texture and it very much bonded together. I added a flower pin made from pre-made felt and embroidery floss. My mom loves the hat, so I would call it a success.